Industrial lighting leader, Larson Electronics LLC, announced the release of a low voltage dimmable LED vapor proof light fixture, that can be used as an alternative to dimmable fluorescent fixtures, providing much longer lamp life and higher performance. It is an ideal fixture for general area lighting, shop lighting, and garage or warehouse illumination in both indoor and outdoor applications where vapors may be present. This low voltage dimmable LED provides a lot of power and versatility for general lighting applications, and can easily replace current fluorescent fixtures. This vapor proof outdoor LED (GVP-48-2L-LED-D-LV) is a dimmable LED fixture great for a wide variety lighting situations. 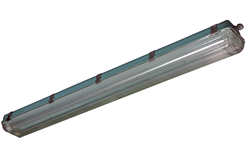 This unit is equipped with two, 4 foot-long, 23W LED T8-Series bulbs, which are solid state LED tubes that produce the same illumination as standard fluorescent bulbs, while only drawing 0.5 amps of power. This unit does not have a ballast, which reduces overall weight and slims down the profile. With no ballast and 50,000+ hours of service life, this vapor proof light fixture is extremely efficient and require much less maintenance. The Low voltage LED operates on 12-24 AC/DC and features specially designed dimmer switches including thr Leviton 6633-PLW, with 0-10V dimming capability. This gives operators the ability to manually adjust brightness quickly and easily, making this lighting unit very versatile. The dimming is smooth and flicker-free. The GVP-48-2L-LED-D-LV is also vibration and impact resistant, thanks to the solid-state design of the two LED lamps. It can withstand extreme temperatures with integral aluminum heat sink tube backings. This unit can either be surface mounted, or hung from cables or chains.